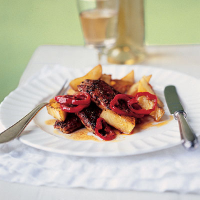 Sweet, juicy pineapple and pepper slices make a perfect contrast to the spicy pork in this really simple supper dish. For an easy accompaniment, cook some Waitrose Spicy Jacket Wedges (found in the freezer cabinet), according to pack instructions. Preheat the oven to 220°C, gas mark 7. Trim any excess fat from the pork and cut the meat diagonally into 1cm-thick slices. Mix together the pimenton, oregano, garlic and salt and rub it all over one side of the pork. Heat 1 tablespoon of the oil in a large frying pan and fry the pork, spiced-side down, for 3 minutes or until golden. Turn the pork and cook for a further 2 minutes. Transfer to a large roasting tin, with any juices. Briefly fry the pepper and pineapple pieces in the pan with the remaining oil, then add to the roasting tin. Cook in the oven for 12-15 minutes, until the pork is cooked through, there is no pink meat and the juices run clear. Transfer the pork, pineapple and peppers to serving plates and swirl 3 tablespoons cold water into the juices from the tin. Return to the boil on the hob, then spoon over the pork. Serve with the spicy potato wedges.